Hello. 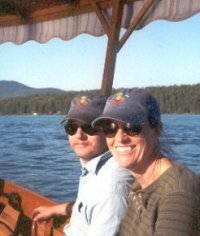 We're Ronnie and Deanna Baird, owners of Rappahannock Boat Works and Tiny Power. Ronnie has been working with steam for almost 40 years (steam trains, steam rollers, etc. ), and he's been building boats for over 12 years now. Deanna has been assisting with the boat building for eight years, machining engines and accessories, and managing the business (and Ronnie). We offer a range of services from boat building to machining to minor foundry work. We are pretty good at designing and building just about anything, so we are confident we can build your project. Please give us a call some time and we'll be happy to give you a quote. Or stop by our shop to see the projects we are working on. We might even have time to take a short steam trip on our local river, the Rappahannock River. Please call during the day when we're home working, but not past 7 p.m. in the evening, Eastern time, please. We'd be glad to talk to you about your own (your next?) steamboat. steaming on the local river.